A few things before we get down to a week of Shashilicious films, thoughts, and fun. First, there are two people without whom I might never have seen any Shashi movies other than Commando: Filmi Geek, who was the first person to encourage me to seek out his films, and Kaddele (of Paint It Pink [index to her Guide to Shashi here] and MissionBAS), who had made them sound like so much fun I'd have to be out of my mind to resist. Special smooches to them - and more to Babasko, Sanket, and Aspi, who also egged me on. Second, I've only seen about 40 of Shashi's movies. (I love how in Hindi cinema it makes sense to say "only 40" of someone's films.) In case anyone cares what I'm basing this whole week on, or where I might have found certain fabulous screen captures, here they are, in chronological order according to imdb. I've tried to keep the diversity of his body of work in mind and sample a little bit of everything, but I'm really weak on his filmography from the mid- and late 1980s. I only know one soul brave enough to delve into those. Phew! 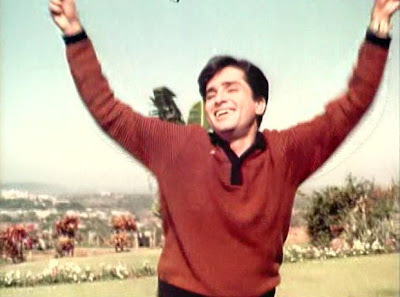 For further appetizers before tomorrow's post, try "Shashi's Scandalously Shocking Shirt Scandal" over at MissionBAS. Justice and 70s men's fashion prevail! Aside: apologies to any readers who don't care about Shashi Kapoor. As hard as it is for me to fathom such a thing, I realize on a rational level that it's possible, and I also know what a bummer it can be for a regular read to flake out on you for awhile. As always, writing challenges are welcome, so if there's someone/something else you'd like to see featured in their own week in the future, say the word. Aww! 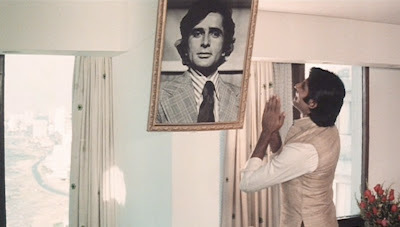 The Amitabh worshiping Shashi's photo pic is my FAVORITE SCREENCAP EVER. What PPCC said! This is going to be a fun week- and I look forward to all the posts! I am looking forward to this; your imagination and creativity always impresses me. But I would like to point out that I am not really brave, I just have friends who think Govinda is the best thing since sliced bread and an inexplicable liking for bad movies. Shweta! - DO IT! I would love watching as many of those as I can get to and following along. bollyviewer - That's exactly the kind of caption I was going to write, but then I wasn't sure if it was in the true spirit of Shashi Week, especially because Shashitabh will be featured. But yes, that's always what I think when I see that picture. While Shashi is not on TOP of my list of favorites, I do not see how anyone cannot enjoy the eye candy that he provides :) And hey---it's your blog, you can do whatever you want.